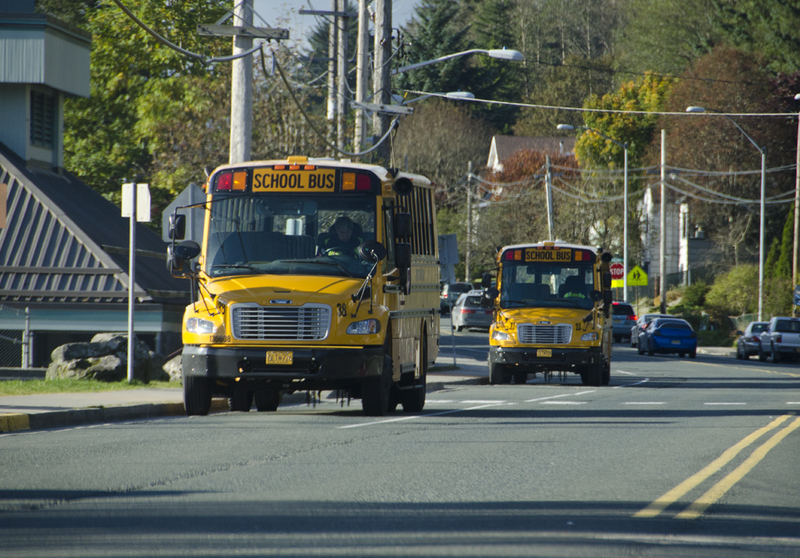 School buses line up to pick up students from school. Good teaching, academic challenges and school atmosphere are keys to staying in school for at-risk students, according to research by the Association of Alaska School Boards. The association has been collecting data for several years from students and staff across Alaska and found that positive school climate helped reduce risk behaviors and increase academic achievement. Now a focus group study expands that research. The association looked at differences between Alaska Native and non-native students in middle and high schools who were either engaged or disengaged. Nearly 300 students and recent drop-outs from 26 rural and urban schools weighed in on what makes students want to stay and succeed in school. Scandling says the Juneau School District just created a group to review ways to support students socially and emotionally. The group of principals, teachers, counselors and a parent started meeting this month. Several programs in Juneau and across the state already aim at countering the personal and academic barriers that keep students from graduating. Sally Rue says Alaska schools already use the information they collect from students to find out whether or not local programs are helping. The association will present its findings during its annual conference this weekend at the Captain Cook Hotel in Anchorage.